According to a new report by the International Energy Agency (IEA), it’s likely that power generation from renewable sources like solar, wind, and hydro will exceed that of gas and nuclear power as soon as 2016. Competitive prices are starting to give renewables a decent leg up in the world energy game. The report also predicts that by 2018, renewables will make up nearly 25% of the global power mix. One of the biggest factors behind this is that countries such as India and China are quickly turning to renewables to help meet their increasing energy demands. The slower growth projected for Europe and the United States will likely be made up for by Eastern markets. China is expected to lead the way in new clean energy technologies. Another factor is the significant decline in the cost of clean energy sources. In countries like New Zealand, Brazil, and Turkey, the cost of wind power is on-par with new fossil fuel plants. Hydropower will be the biggest source of clean energy in the short term, according to the report, which it says will account for more than two-thirds of renewable output by 2018. Onshore wind power technology is on track to reaching 75 countries in the next 5 years, and more than 50 countries will generate 100+ megawatts of biofuel electricity. Unfortunately, the IEA’s outlook for solar isn’t as encouraging. It predicts annual growth will be around 25% over the next five years, quite the drop from the 45% annual growth rate between 1998 and 2012. Solar cells present a myriad of problems that will need to be sorted out before it will work its way into a more significant part of the network. However, the IEA has underestimated the growth in solar in the past. Overall, this has been a good week for renewable energy news – between Obama’s new U.S. climate plan and predictions in growth for the next several years. Now it’s time to tackle fossil fuel subsidies, which unfortunately are still going strong. What do you think needs to happen next to boost the global renewable energy market? 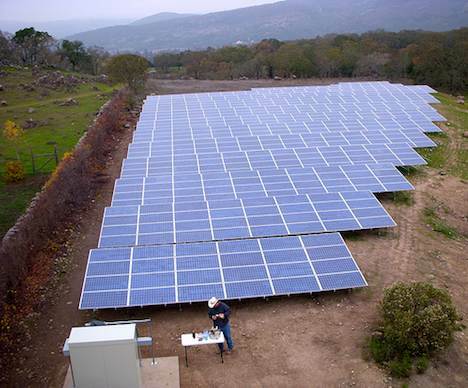 Image CC licensed by Steve Jurvetson: Solar installation in the rural U.S.
Next post: Potentially Historic & Prolonged Heat Wave Forecast For Western U.S.